Kecap manis [pronounced: ketchup MAH-nees] is an Indonesian sweet soy sauce and ubiquitous ingredient in Indonesian cooking especially Java. You may see two other different spellings beside kecap; kicap and ketjap. Kicap is used by the Malaysian while ketjap is used by the Dutch. Actually, ketjap was an Indonesian spelling back before 1972 when the Indonesian used the old spelling. Kecap manis is made from fermented black bean or soybean, flavoured with shallot, garlic, star anise, galangal, Indonesia bay leaves (salam leaves), lemon grass, kaffir lime leaves and sweetened with coconut or palm sugar. Each kecap manis producer has its own secret recipe. Through my searching, some recipes call for lemongrass and kaffir lime leaves, some don’t. You may be interested with a lovely post of sijeleng on how to make traditional kecap manis in Kediri, East Java. A word kecap, allegedly taken from the language or the Amoy dialect kôechiap tsiap. Amoy (Xiamen) is a Hokkien dialect which originally comes from Southern Fujian province (in Southeast China), in the area centered around the city of Xiamen. It is highly similar to Taiwanese, and is widely known as Hokkien in Southeast Asia. I literally have influenced bulé husband with kecap manis. He said that kecap manis is one of his happy sauces. In Winnipeg, kecap manis of ABC brand is sold at most Asian markets and any Superstores (large Canadian grocery chains). As an Indonesian, I love Bango brand more than ABC, but bango was not widely sold in Winnipeg. I sometimes got the Bango brand from Vancouver or whenever my husband went down to Minneapolis, US. 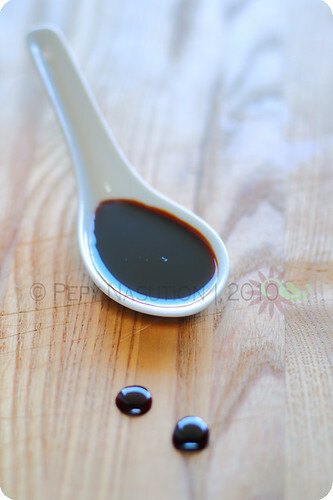 Since the mixture has been added with coconut/palm sugar, kecap manis does not require a refrigeration to store it. Keep it in your cupboard. The sugar itself is a natural preservative. Guess what? In early 2010, there was a new Asian store (it is a branch from Alberta) open, Lucky. It carries my fave kecap manis. Now, I can get Bango in Winnipeg. Honestly, I was dancing in the store when I saw it for the first time. OMG, I feel ashamed whenever I remember it!!! Another thing that I’d like to share, Bango brand is GLUTEN FREE*. For you who have problem with gluten or celiac disease, this brand is good for you. By saying much good things about Bango, I want to make it clear, I don’t get paid from Unilever Indonesia which produces this kecap manis. I just write what I like about. What is kecap manis for? Kecap manis can be for a dipping sauce, any stir fry dishes (including nasi goreng, bakmi and bihun), Indonesian style steak (known as bistek/bistik), glazing my BBQ dishes such as for sate (chicken, beef, fish, shrimp etc), for rujak (Indonesian fruit salad) and many other uses. I love to mix kecap manis with chili and shallot slices, then drizzle with a bit lime; preferably nasnaran mandarin (jeruk limo/sambal) or calamansi. Ooo there is another use. The Indonesians love to mix kecap manis and lime for a cough remedy. * bulé is a slang term for Caucasian in bahasa Indonesia. The sambal kecap recipe sounds great…I love the spice in it. Just wondering how is it gluten free? I thought kecap manis was made from soy beans? I'll have to keep an eye out for this brand. I usually use ABC because that's what I see more commonly. I love this kicap manis. I love it in frying noodles. Well, I just learned soy sauce together with lime can be used for healing cough. Thanks. OMG I love kecap manis! I add it to everything, really. I don't think I've seen this brand before, I always use ABC. @karen: sambal kecap is my all the time fave if I don't feel eating anything. @Wandering Chopsticks: Yes… kecap manis is made from soy beans, but many brands add wheat flour to thicken their kecap manis. @Pigpigscorner: Outside Indonesa, this brand is not as popular as ABC. Even in North America, not all stores have them. Thanks for sharing the best brand of kicap manis. I don't usually pay attention when I buy this, I have been using ABC brand. I will look for Bango brand next time I go to Asian store. It's one ingredient I use almost everyday in my cooking! Long live Kecap Manis! we use the ABC brand kicap manis because that's the only brand that we recognized in the stores. But I will keep an eye out for this Banjo brand. Not sure if they have it here in Kuching. Yeah it is a must in Indonesian cooking, especially this brand. It was owned by a small local company and then bought out by Unilever. I usually see the ABC brand around. oh Kecap Manis! it's so perfect with even the simplest dish ever, warm white rice and half cooked sunny side up eggs! YUM!! I've heard of this but never really knew what it was. Thanks for the info and congrats on now being able to get your favorite brand. I've definitely experienced that some feeling of elation about many Chinese foods I thought I'd never find locally. Beautiful and glossy kecap manis. Love your first pic. How did you take it? A cough remedy! Who knew! That's so interesting. And thanks for telling us the differences between brands. When I see them all on a shelf, I'm always perplexed as to which one to buy. Yup! Me and my Javanese hubby love kecap Bango so much. I think the sweetness level is enough and I don't find the slightly sour taste like other brands do. I posted so many recipe using kecap manis too. I have been looking for a recipe of something I had quite a bit in Bali. It was some sort of noodle (about the size of spaghetti or slightly thicker, like Udon) and it definitely had Kecap Manis in it, also had cilantro and either pine nuts or soy nuts. Any idea what it was? cilantro isn’t something that common in Indonesian cooking. From your description it’s a fusion food that they serve. Yes we do have a thick noodle. I think the food that you had was a sort of Mie goreng (Indonesian fried noodle) that was a fusion version. Hi, I hope you’d still see this comment! I was wondering, where do you get kecap manis in Minneapolis? Based on your stellar review of Bango Kecap Manis, and your statement that Bango Kecap Manis is gluten free, I ordered 3 bottles. I guess I did not pay enough attention to the list of ingredients when I ordered it, because I was surprised and disappointed when I got my order of 3 bottles (identical to the bottle in your picture) that one of the ingredients listed is wheat. Here is the list of ingredients on my Bango bottles of Kecap Manis: Water, Palm Sugar, Fermented Soy Bean, Wheat, Salt, Sodium Benzoate. So yes, I am sure this Kecap Manis is very tasty, but it is not for anyone with Celiac Disease or anyone needing to avoid gluten. Where do you by the Bango kecap manis in Winnipeg? I’d love to find some that’s gluten free. Sate Tempe Plappa | Perth Food Snap!